The Agricultural Correspondent has been wheeled out again. Just as we get to an exciting bit in the storyline – has Helen Archer finally seen through Rotten Rob? – we are kept on tenterhooks by some bit of farming nonsense. So Tony and David Archer mooch around the cattle market discussing the merits of buying organic suckler cows and we are made to wait for the resolution of the TunaGate affair. What’s good enough for The Archers is good enough for you lot. So before I tell you what was in the letter from Hammersmith Hospital, I’m going to share some gardening news. If by any chance you didn’t read Wednesday’s blog – number eighty eight – now would be a good time to nip off and do so; otherwise what follows will make no sense. We’ll wait for you by discussing fencing. I really wanted to get the fences sorted out this half-term. It started out well: ivy cut down and then a brilliant morning spent playing with LittleBro’s power-washer. All that remained was to choose a colour and paint the fence. 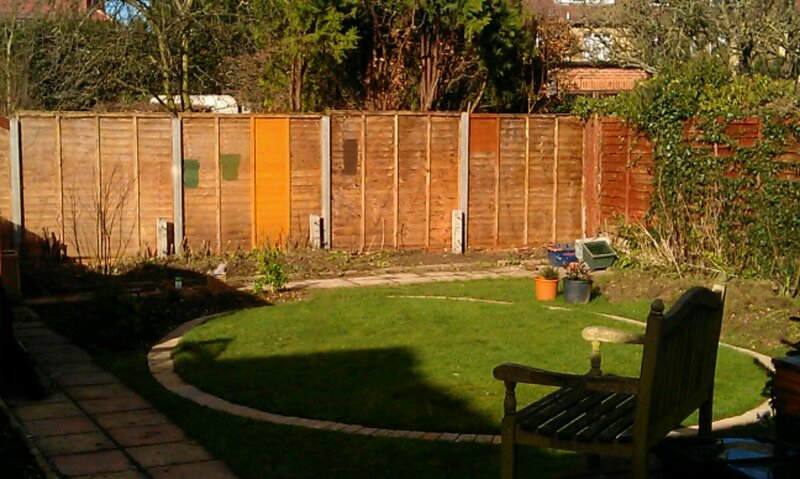 I’ve now tried out five different fence colours and am still undecided. The whole exercise would have been made so much easier – and cheaper – if the colour of the paint in the tin actually resembled either the colour on the label or the colour on the example lump of wood in B and Q. Or, preferably, both. So here’s my suggestion: that fence paint is, by law, actually called something which truly gives you an idea as to the colour. For example, my first attempt could be more accurately called ‘Last night’s Vindaloo’. At the moment, I’m trying to choose between ‘Constipated Toddler’ and ‘New-Born’s Nappy.’ Just a thought. The letter from the Hammersmith Hospital told me that I was actually on the proper drug in the trial, not a placebo. What’s more, I was on the higher dosage. The letter went on to give headlines for the results of the trial. It appears that the drug does remove excess iron from the Parkie brain – tick. It doesn’t appear to have worrying side-effects – tick. And there is no indication that it affects the progress of Parkinson’s adversely – tick. All extremely promising. So, as I mentioned in my last blog, it is possible that the fact that my Parkinson’s seems to be treading water is to some extent due to having taken this drug. Just my hypothesis. But surely worth an investigation? The next step is that the results will be properly written up and presented to the scientific community for peer review and analysis. In the meantime – and here’s the rub – the team are still trying to find funding to take the trial forward to the next stage – a more extensive study over two years. Even with all those ticks, the trial may just grind to a halt through lack of money. Fact is, there are a number of very promising research projects into Parkinson’s. Treatments which can delay progress or even turn out to be a cure are there, just round the corner, seen through a glass, darkly. It seems that all that is needed – all that is needed – is enough money to deliver and Parkinson’s can be cured. But the two Parkinson’s charities just can’t fund it all and there isn’t enough Government money. Perhaps it is a credibility thing. Actor Laddie is currently preparing a Talking Book for the RNIB – a collection of the Queen Mum’s letters, gawd bless ‘er. He read me a passage yesterday when, as Duchess of York, she visited what is now the Royal Hospital for Neuro-disability. Except then, it was called the Royal Hospital and Home for Incurables. Parkinson’s can be cured. Think of the misery this will avert! Think of the money saved in drugs and in care! Why isn’t this big news? Shall we take our shakes to the barricades? I’ll answer that question shortly. But first, can I just remind pregnant women not to go into lambing sheds. The Ramblings program interviewing Tom Isaacs can be caught here. There is also an appeal for the The Cure Parkinson’s Trust on Radio 4 coming up on Sunday 23rd Feb at 7.55 a.m. Details are here. So hopeful yet so frustrating. I’m always looking but I hear little in the news about Parkinson’s research. The last time was when Billy Connolly ‘came out’. That’s exciting news that you were actually on the drug. Any news on Helen Archer? You know I’m a part time listener.